The main challenge for most website owners is to get enough traffic. Without traffic, it will not give you many opportunities. Traffic can, however, be expensive, and therefore many of us are looking into the possibility of free traffic. In this article, I will explain how to get free traffic to your website based on my experience working with this for several years. I will discuss some of the best sources, but will NOT just go over a list with superficial advice and a list of places you can do this. 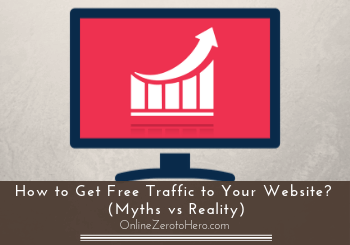 There are a lot of myths about free traffic and a lot of bad advice about it where you can end up wasting a lot of time. I will therefore instead look at the most popular sources and explain why or why they might not be a good option so you will know the myths and realities of free traffic before spending time on getting it. What is free website traffic? I first want to clarify what I mean with free traffic. By free, I mean things you can do yourself to generate traffic for your website without having to pay for it. This does NOT mean it will not take time. When making a strategy for traffic for your website, you first need to make one thing clear – you can get free traffic but it will take time. You can also get traffic faster where it will not take much time, but then you will have to pay for it. So this is important to understand. You can easily combine both approaches, but before starting here I just want to make it clear that if you want free traffic, you need to be willing to put in some time. You cannot both get traffic without spending any time at all and completely for free – if this is what you are looking for, you will have a hard time succeeding online. What to be aware of before looking for free traffic methods? I just wanted to follow up on the point above before we get to the myths and realities of free traffic sources. You will see online that there are some people that claim to offer exactly what I just said above is not possible – a completely free and super fast way to get tons of traffic. Do not believe the “secret” systems that promise to generate super fast free traffic. Do not fall for such claims. These so-called secret systems to hack the internet and send all the traffic directly to your site is NOT real. It is usually just a trick to get you to sign up for their seemingly cheap program only to bombard you with upsells. And you will then also find out that the “secret” traffic system usually is one of the methods I will explain below and not really secret and will not generate the results automatically as they promise before you buy. So do NOT fall for anyone that claims they have a secret system to send tons of free quality traffic to your site with just the push of a button – such a system does not exist. Below I will go over some of the most popular ways you can generate free traffic for your website. I will, however, not just list them as I think there are a lot of bad advice out there about how to use some of these sources. In fact, you can end up wasting a lot of time by using some of them if you are not aware of what you are doing. So my goal with the list below and this article is to explain some aspects of each of these traffic sources that you will usually not be told. Then you will know what to expect and can better choose the sources that fit into your overall goals and spend your time wisely. Many people will say that leaving comments on other blogs/websites can be a great way to generate traffic for your own. Honestly, I often think this is NOT a good use of time. Yes, it can at times give a little extra traffic to your site if you comment on other blogs and people see a link to your site there. But it is not a long term traffic strategy that will take you far. It will take a lot of visits to the site you are commenting on to generate any real traffic to your site. And comments move down over time, so it is not something that will continue over time even if you do end up getting some traffic from it. Also, if you do use this method, you need to do it with quality and provide value to the conversation to have any chance of people visiting your website from the blog comment. Many people think it is just about posting as many comments as possible with a standardized message – please do not do this. I get comments like this on my websites every day. You will just end up upsetting the website owner and giving your own website a bad reputation instead of building a relationship. Example of a spam blog comment on my website trying to get traffic this way – do NOT do this! Commenting on blogs can be a good way to participate in discussions and build relationships, so for this purpose, it can be worth considering. But for free easy traffic, it is really not an ideal way. And do also not think that it is a great way to get backlinks and boost your traffic this way. Links in comments do not hold any value for this purpose anymore – it is an old school method that does not work anymore. So do not waste time trying to get backlinks like this to try to boost your traffic. Social media can, without a doubt, generate a lot of traffic if you do it properly. 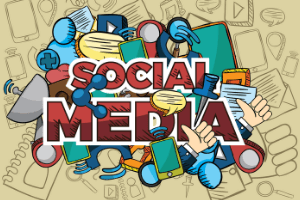 Social media can generate free traffic – but it is not always a good idea. I am not here going to talk about social media strategies as this is a huge topic and something that can be studied for a long time to become good at it. My point of mentioning it here is that it definitely can be a great traffic source. But it is not easy. Getting organic reach has, for example, become more difficult on Facebook and it can be very difficult to generate any real traffic unless you put in some advertising money to increase your reach. This is not only on Facebook. There is a lot of competition on social media today and A LOT of content published constantly. It will, therefore, naturally be harder to get attention. This does not mean you should not use social media. It can definitely give good results if you are willing to put in the time and learn the strategies and use it continually. You just need to be aware that just because you are on social media and drop a link to your website once in a while, does not mean you will get traffic. It takes more than this, and you just need to be aware of this and not just blindly follow advice from someone that says “oh, just get a Facebook page and post links” – there is more to it than that. Also, you will often hear people say to just share your links in Facebook groups. Unless you have your own group where you provide real value for people, this will rarely give much traffic and will take a lot of work to get just a bit. Most groups also do not allow self-promotion and the ones that do are overflown with it so people are only there to promote themselves and not to see what other promote. Using social media can be great, but do not believe the people that say that traffic will just magically and easily come from this. Getting traffic from the search engines through SEO and by creating great content is a very popular way to generate free traffic. The advantage of this method is that the people that come to your website through searches in Google and other search engines are actively looking for the info you are providing. Organic traffic from the search engines is highly relevant traffic. This makes it highly targeted and relevant traffic. Also, if you do it properly, it can really build and explode over time and create a river of traffic to your site every day. And the work you do today can bring traffic for years to come. The challenge is then the time and patience it can take to make this happen. Getting high rankings in the search engines is great for a website but it does not happen overnight and without effort. So if you are going to use this method, you need to be willing to put in some effort. The more competition there is in your niche, the more work and patience it will take. Be careful about believing the people that claim they have a secret ranking hack that can get you to the top of the search engines in no time. Often this will just be a scam to get you to pay or by using black hat techniques, which can be very risky in the long run and you can end up getting completely kicked out of the search results. I very often see people saying that participating in forums like reddit, quora, and other forums is a really great way to get free traffic. It can give you some traffic, but again, it will not just be easy and by spreading your link everywhere. Most forums worth participating in will have some rules that say you can not just post links to promote yourself or your website. Many forums will not allow you to post links to promote yourself. The whole point of a forum is to have valuable conversations there, so if you are not contributing with value, it is likely you at some point will get banned. I have even see people that actually do provide a lot of value suddenly get banned and then that traffic source is gone. Participating in forums can be great for branding but you need to put in quite a bit of work to get value out of it. The usual advice about you just have to go to a forum and give a short answer and share your link will NOT work in the long run and is not a sustainable way to generate consistent traffic to your website. In the hunt for free traffic, a lot of traffic exchange services have been created. These are programs where you join and submit your website. By browsing other members’ website, you will earn credits and can then get other members to visit your website. The traffic from traffic exchange programs can be very low quality. This will without a doubt generate traffic. But will it be worth it? Just think about it – if you joined a network like this, what would your purpose and goal be? Probably to just visit as many websites as fast as possible so you could get other people to visit your site. But if this is your approach, do you also not think other people will think like this? This means that you might get a lot of traffic like this, but you will mostly get traffic from people who are just visiting to earn credits to get other people to visit their website. I am not saying there are no traffic exchange services that works. There are many I have not checked but I have seen a lot of very poor services like this as well. So if this is a traffic method you are going to use, then make sure to really examine the quality of the services and monitor the traffic through Analytics to test if it is worth it or not.